If you want a good quality, but compact sized shed, then the TGB Garden Store 5×3 Shed could be the shed you are looking for. This is a very smartly designed shed that has a lot of personality. It has a very smooth look to it, but it also has that classic shed design. 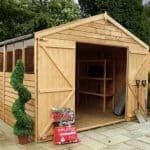 If you want a shed that is going to effortlessly blend into your garden and not take up much space then this shed is ideal. The shed is designed so that all you have to do is open that good sized door and reach in so you can grab what you need. While it may not be the biggest on storage size, this shed is actually very big on quality. The whole shed is supported with a very thick and strong frame. Attached to this is the cladding. The cladding has a very smart look to it, and at 16 mm thick this tongue and groove shiplap cladding is not going to allow any rain inside the shed at all. The strong flooring will allow even your heaviest tools and gardening equipment to be stored. Stopping the rain pouring on top of your belongings is a pent roof that has a slight overhang to protect the front of the shed. 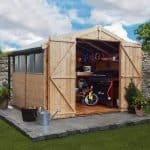 Today we are looking at the TGB Garden Store 5×3 Shed. 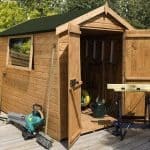 This is a simple, but effective shed that is ideal for those who just need a little storage space and who do not want a shed taking up a whole lot of space in their garden. We do feel that this is actually a very good looking shed and will look fantastic in any garden. 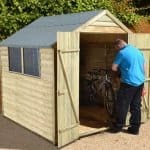 The shed offers you 4 feet 9 inches of width and just a little over 3 feet of depth, so you will have to be a little bit crafty with how you organise things. But tools, gardening equipment, a lawn mower or even just the children’s outdoor toys will all fit comfortably in here. The shed is not the tallest as it is under 6 feet tall at its highest point, but to be fair this is not the kind of shed you walk around in – it is the kind of shed where you open the door, grab what you need and then just close the door. Some very decent quality timber is what they have used for the roof. We wish we could tell you the exact specs, but they have not given that information. This is a pent roof which slopes to the front. If we are being honest, we are not the biggest fans of when a roof slopes towards the front of the shed, but to help keep the rain from running off the front of the shed, there is a slight overhang which should help. 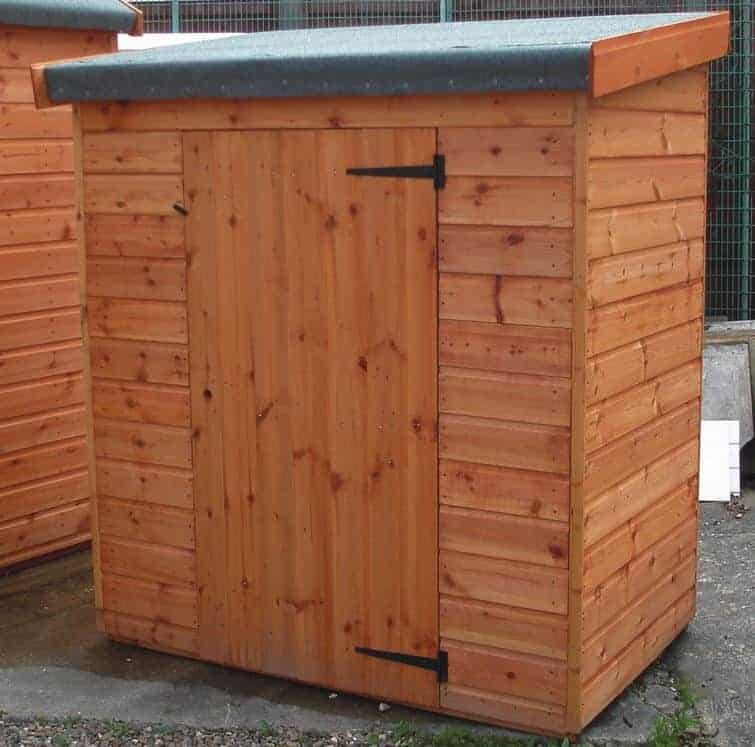 The TGB Garden Store 5×3 Shed is made with 16 mm thick tongue and groove shiplap cladding. We really like the cladding they have used as the smooth look of it really is classy. This cladding at 16 mm thick is actually a lot thicker and stronger than what you would normally see on a shed of this size. The way this cladding interlocks means there is no way that rain is getting in here to ruin your belongings. The cladding is an impressive thickness, but so is the frame they have used. Keeping the shed together and giving it a sturdy feel in the process is a 38 mm x 50 mm frame. This is a fantastic frame and it really is going to make sure that even 20 years from now the shed is still standing strong. While they do not go into exact details about the floor, we can tell you that this floor is going to be able to handle a lot of weight. This floor is made with strong timber which is then backed up with impressively strong floor joists. This makes for a very good team and even heavier items like a mower or power tools will not cause this floor any problems. 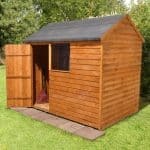 Like most other sheds of this size and price range, the TGB Garden Store 5×3 Shed is only dip treated. This means that you will be responsible for making sure the wood is well protected. Do not worry as this is actually very easy to do. Just a coating of wood treatment, shortly after construction is all you have to do. Then once a year a fresh coating should be applied. They do not make any mention at all about the warranty that comes with this shed. This is very frustrating, but in our experience a shed like this will most likely give you a ten year anti rot guarantee as long as you treat it properly. Just be sure to ask about the warranty before you order. 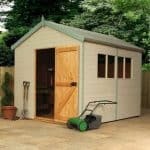 The TGB Garden Store 5×3 Shed has a single door located right in the middle of it. This is the standard kind of door we would expect to find on a shed of this size. It is 2 feet 4 inches wide and 4 feet 7 inches high so we do not see you having any trouble reaching in and grabbing what you need. Here at WhatShed, we can be a bit of a nit picking bunch, but we do have to say that we feel they could have used a third hinge on the door to help make it extra strong. This shed is fully boarded so there are no windows. We have noticed that this is actually a pretty common thing with sheds of this size. There is not exactly a whole lot of security on offer with this shed. The door will be kept firmly closed with the included turn button catch, but if you want to lock the door then you will have to attach some kind of hasp and padlock system. With there being no windows on this shed, you do not have to worry about your belongings being on display. This means if you do manage to put a lock on the door then any expensive items you have will be kept securely hidden away. We really like the natural wood look, but if you want to give the shed a bit of colour then that is easy to do. We have seen wood treatment in all kinds of colours these days so if you want to give the shed a bit more of an outgoing personality then have a think about a wood treatment in red, blue or green. There is only one extra on offer with this shed and it is actually a pretty useful one. For £4.99 they have a very high quality security hasp and padlock set. This will allow you to lock the shed up at night and it also is very easy to install. We know that sometimes a retailer will add on all kinds of crazy extras, but we do feel that this one here is actually worth thinking about. We were very impressed with the overall quality of this shed. While we do wish they gave a little bit more info on what exactly the floor and roof are made from, in general we are very happy with what they have done here. While you will have to roll the sleeves up and give it a coating of treatment once a year, this shed in return is going to give you many years of use. Even for a 5 x 3 shed, this one here is a little on the compact size so be sure to plan your storage well and not just toss things inside the shed. This is a two person job, but we do not see it taking you and the person you con into helping you out too long. There is not a whole lot to putting this shed together and we think that you should be able to get it done in just a few hours. This is a little higher priced than some of the other 5 x 3 sheds, but we feel with the high quality materials used in its construction, the price is actually pretty fair. A 5 x 3 shed is usually something that people who just want some basic storage look for. The TGB Garden Store 5x3 Shed gives you that storage, but it does it with a classy style and a strong design. What you have here is a shed that once installed, if looked after properly will give you many years of use. They really have used some fantastic materials in the construction of this shed and while that has made it a little more pricy than some of the other similar sized sheds. We feel that for those of you who want something a little more high quality and easy on the eyes, this may actually be the shed for you.